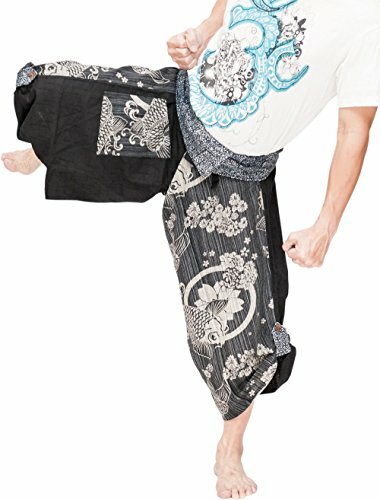 These special design harem pants have fisherman pants style wrap around waist and belt, totally unlike anything before them. The main fabric is made from soft cotton with subtle texture. The fold over waist is made from traditional indigo dye handmade fabric from hill tribes in northern Thailand that emphasizes the tribal look and feel. There is one side pocket with matching design for your essentials. The hem has matching pull-up tabs for added personality. These performance pants are design for extreme mobility, perfect for Yoga, martial arts, dancing, and other performing arts. So these unique pants will be your best friend in just about anything your love to do. Combat Sports Thigh Guards (Pair), 23" x 69" x 5/8"
Fire Staff - 1.6m (6 x 65mm wicks) by Flames 'N Games + Travel Bag!